Prime Minister Ranil Wickremesinghe skilfully handled the political crisis that erupted on 26 October 2018 and continued for some seven weeks, mobilising an alliance of political parties and civil society groups, on a common platform of respect for the constitution and rule of law. The stature of the judiciary grew considerably over this period. At a time when the executive branches of government in many parts of the world are dominating legislatures and judiciaries, Sri Lanka showed itself to be different. The Sri Lankan judiciary succeeded in taming politicians who ran amok in both the executive and legislature. First, judges held that the Sri Lankan constitution did not permit the president to dissolve parliament so early in a parliamentary term. While the 19th Amendment to the Constitution specifies that parliament can only be dissolved by the president after four and a half years, this was done when barely more than three years of its five year term had elapsed. The judges then held that Mahinda Rajapaksa, who was defeated in several no confidence votes in parliament but refused to step down, could not continue to act as prime minister until the case was decided. So the stock of the judiciary is at an all-time high along with civil society that has taken a principled stance in upholding the constitution and rule of law. Civil society groups actively explained the constitutional issues involved to a bemused population and publicly challenged politicians who held contrary views. The clear violation of constitutional norms and parliamentary traditions led to unified civil society activism that campaigned hard, and with unity of purpose. Civil society activists found common cause with political groupings that objected to what had happened. They argued against the thesis put forward by supporters of the president’s actions – i.e. that sovereignty of the people is uppermost in a democracy whereby a readiness to seek a new mandate justified the drastic actions of the president in disregard of the constitution, sacking the prime minister and then parliament. What was at stake in this political power struggle was adherence to the constitution as the foundation of the rule of law, which civilises the use of power by setting boundaries. 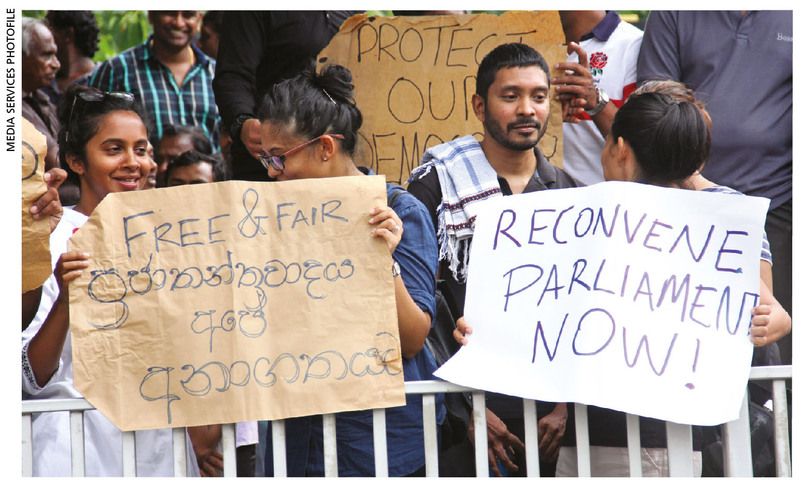 Constitutional provisions enshrined in laws are not – as President Maithripala Sirisena seems to have been misadvised – mere guidelines for action. If the rules of the game are not followed this time, the violations could be worse the next. The common position of civil society and political parties forced into opposition was that there should be a return to the status quo of 25 October. Their main concern was that an unhealthy precedent would be set for presidents to act as tyrants without respect for the constitution or rule of law. As the constitution has now been adhered to and the rule of law is followed, there’s hope that Sri Lanka will mature and emerge as a more united polity. These unfinished tasks from their 2015 pledges must be delivered. Under the National Unity Government, Sri Lanka did much in those areas. It needs to do more. The government is better off working together with the president than in opposition to or while waging a cold war against him. The year ahead provides the last available period for the UNP and SLFP that worked together for the first time in history to continue to do so. It is through their collaboration that the country’s most vexed and intractable problems, such as the ‘ethnic conflict’ that gave rise to nearly three decades of terror and war, might be resolved. Of the unfulfilled promises to be delivered, the most important is to find a just and lasting solution to the national question by ensuring that decision-making power is shared equitably between ethnic majority and minority communities. The door will remain open if the SLFP and UNP are willing to work together, along with civil society and the judiciary, to find a solution. If the focus remains on making positive changes to move the country forward, the president and prime minister can make the period until the presidential election at the end of this year a most decisive period in Sri Lanka’s post-independence history.